I travelled to Peru via Amsterdam from London Heathrow, landing in the capital city if Lima, the fifth largest city in Latin America. The main part of the trip was to complete a 4 day hike to the Inca Ruins at Machu Picchu. View from the window of the massive engine on this KLM Boeing 777 over the South Atlantic. After landing in Lima, we took a taxi from the airport to our hotel in Central Lima, The Sheraton. The view from the room wasn’t too bad overlooking The Palace of Justice (Spanish: Palacio de Justicia) which is the seat of the Supreme Court of Peru, shame about the traffic though! The stay in Lima last only a few hours before a short flight up to the mountainous city of Cusco (Elevation 3,310 m (10,860 ft)). The first thing put under my nose was Coca tea, it helps with the altitude sickness supposedly. Coca tea, also called mate de coca, is a tisane (herbal tea) made using the leaves of the coca plant; typically the raw leaves of the plant. It is made either by submerging the coca leaf or dipping a tea bag in hot water. The tea originates from the Andes mountain range, particularly Bolivia, Equador and Peru. Cusco is the historic capital of the Inca Empire and was declared a World Heritage Site in 1983 by UNESCO. The Plaza de Armas is the main square in Cusco and has some beautiful churches. Cusco was the capital of the Inca Empire (1200s-1532). Many believe that the city was planned as an effigy in the shape of a puma, a sacred animal. 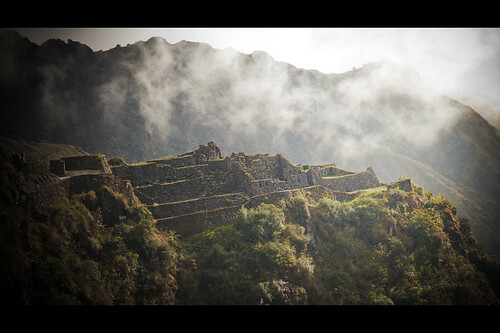 Under the Inca, the city had two sectors: the urin and hanan. Just off the Cusco main square leading down to the market place was a typical street scene. The Sacred Valley of the Incas or Urubamba Valley is a valley in the Andes of Peru, close to the Inca capital of Cusco and below the ancient sacred city of Machu Picchu. The valley is generally understood to include everything between Písac and Ollantaytambo. We took a bus tour around the Sacred Valley on our second day before we headed off on our Inca Trail hike. Its a good idea to have a couple of days before you start your hike to adjust to the altitude as it certainly affects your breathing. The Sacred valley was appreciated by the Incas due to its special geographical and climatic qualities. It was one of the empire’s main points for the extraction of natural wealth, and the best place for maize production in Peru. Local people selling souvenirs at the entrance to the ruins, you can see the Inca terraces in the background. Ollantaytambo is a town and an Inca archaeological site in southern Peru some 60 kilometers northwest of the city of Cusco. It is located at an altitude of 2,792 meters (9,160 feet) above sea level. Temple Hill and Wall of the Six Monoliths, a steep hill on which the Incas built a ceremonial center. The Incas built several storehouses out of fieldstones on the hills surrounding Ollantaytambo. Their location at high altitudes, where there is more wind and lower temperatures, defended their contents against decay. To enhance this effect, the Ollantaytambo qollqas feature ventilation systems. It is believed that they were used to store the production of the agricultural terraces built around the site. Grain would be poured in the windows on the uphill side of each building, then emptied out through the downhill side window. On the drive back the view over a large Peruvian town. So it was back to Cusco for a night then an early start and a bus ride to Piscacucho – Km. 82 to start the 4 day hike on the Inca Trail to Machu Picchu. This is the first view you get of the trek ahead. A river crossing on a rope bridge really sets you off on what will be one of the best things you will ever do! Our group consisted of 15 people from all over the world, headed up by 2 tour guides and a whole group of porters who carry all the tents and cooking equipment for you and set these up each day for lunch and dinner. These guys run up the mountain complete with gas canisters on their backs! Within 10mins of setting off we came across a local woman and her donkey on the way down the hill. The trail on the first day isn’t too bad, although you are full of energy at this point and raring to go. Give it 3 more days of walking up steep hills for 8-10 hours a day, I’ve never ached so much in my life. The first view of Inca settlements on the hike. These ruins were located at the top corner of a peak, so a good view all around the surrounding area. After a short break on the ruins we headed dooooooown!! The trail you walk goes from nice gravel tracks to virtually impassable every few miles. Here is one example of a path on the first day. The first day drew in and this was what we called home for the evening. Our porters erected an eating tent and served up some great food. Once daylight had faded and the sky became dark the stars came out to play. I’ve never seem so many stars in the clear sky, a superb sight. Day Two started by being woken by the shout of “Amigo! Coca Tea” this was to happen around 5am each morning as the porters got you up to start the days hiking. Todays walk took us over one of the highest passes on the Inca Trail, Dead Womans Pass. Firstly the tracks got steeper and muddier! The weather was wet and the clouds were low as we edged step by step towards the top of the next peak. This being the highest one the pace of the group had slowed due to the altitude and lack of oxygen, it felt like walking in slow motion at times. This is the view from the top of the Dead Womans Pass / Warmiwañuska at 4,200 m.a.s.l. Various ruins along the walk. Here the path became very uneven made with broken rocks. The walk is never to difficult as long as you take your time, our group at time spanned 1/2mile front to back, some people wanted to walk fast and others slow, so one guide was up front and the other at the rear of the group so everyone kept safe. We arrived at camp early evening after around 8hrs of walking. Today happened to be my birthday and one of the guides had spotted this on my passport before we had left and he signalled back to base and one of the porters had brought a fresh cream cake up the mountain and a few bottles of beer and wine. So in the large dark blue tent on the right of the photo we had a good evening. Morning soon came around and the haze you saw in the previous photo cleared to reveal this magnificent view. Before leaving camp we had a chance to thank the porters and tour guides for their help in carrying all the equipment and cooking all our meals, these guys certainly made the trip enjoyable. Today a lot of walking was done very close to the edge of a steep bank, you wouldn’t want to fall off! At times the route was steep and took you through rocks, here this porter stops and waves as he was running by. Looking out above some of the Peruvian mountain ranges on the way to Machu Picchu which is somewhere just beyond those peaks. Today was a short walk to the last camp before the early morning walk to Machu Picchu, one the way there are some large ruins at various look out points. Heading down to the nights camp at Winay Wayna, here there is a bar and a hot shower, well worth the money! We walked down to the ruins above and looked out onto the valleys. Our guide informed us that this was the “Valley of the 2 rainbows”, you can see why. These guys decided after 3 days of hiking without a proper wash it was time to dive into the waterfall. Take it from me this water was very very cold!! That was the end of the day and we retired back to camp as in the morning we were warned we would be up at 2am to go and queue at the checkpoint before the 1hr hike to the sungate and Machu Picchu. So after the early start and hike this is the final climb before you see the Inca ruins at Machu Picchu, its a real hands on steps climb as its rather steep. At the top you finally reach the sungate and look down on Machu Picchu. So the trek down to the ancient site started, it was around 5am. Once we arrived at the ruins our first view was from the back, not the usual view you see on the postcards however its still dramatic. This photo won a round in the Daily Telegraph Travel Competition The Big Picture. Of course the obligatory Llama photo at Machu Picchu. The usual tourist shot of Machu Picchu. So that was Machu Picchu done, we descended to the nearest town Aguas Calientes to stop the night before taking the the Vistaliner Train back to Cusco. On arrival at Cusco we had 1 night where we tried the local dish of Guinea Pig, not a lot of meat and very boney. The next day we headed for the airport and back to Lima for 2 days. Some very cool old cars travel the streets of Lima, some of the driving on the roads could be described as “interesting”. The main tourist part of Lima is Miraflores. The bars and clubs over look the beach high on the cliffside. We did walk down to the restaurant on the pier. Having done the walk and heard stories of others who did the walk down I think we were lucky to come away with all our belongings intact. Maybe better to get a taxi down there and back. In Lima just stay aware, I never felt threatened but at the same time it felt anything could happen at anytime. We had a group of 5 people so safety in numbers. Down on the beach you can go surfing and paragliding, one of our group went surfing with some of the locals who were hiring out wetsuits and boards. 2. Thin layers as the temperature can change – I travelled in April and worth a thin dry fit full sleeve top and walking trousers most of the time. 3. Suncream, Wet Wipes, Imodium, large brimmed hat, blister care, muscle rub. So thats the photo blog for Peru over. I hope you enjoyed reading, please check some of my other trip blogs. Excellent blog and some fantastic pictures from what looks like an amazing trip. Somewhere i would love to go but can’t see it happening really.